Troy Vest suffered burns over 80 percent of his body before he was airlifted to the Parkland Burn Center. With his wife by his side, Troy underwent multiple surgeries during his grueling four months of recovery in the hospital. During that time, his energy and toughness won over the staff. These relationships are the heart of the work performed on the unit and last long after patients are discharged. Parkland provides social support for children and adult burn patients following their hospitalization by hosting a burn retreat for adults, burn camp for children and survivor reunion picnics for families. Parkland Burn Center is the second largest civilian burn center in the nation. Parkland admitted patients from 96 surrounding counties. The age of admitted patients ranged from young infants to mid-nineties. More than 1,800 burn patients were treated at Parkland in 2016. 35% of all admissions were Dallas County patients. As the only adult and pediatric burn center certified by the American Burn Association in North Texas, the Parkland Burn Center provides the most advanced care possible for burn patients throughout 96-county region. Children make up one-third of all burn patients. Parkland’s Back to School program is designed to help children and teens re-enter school with confidence and support by educating teachers and students about burn injuries. No one is immune to suffering a burn injury. 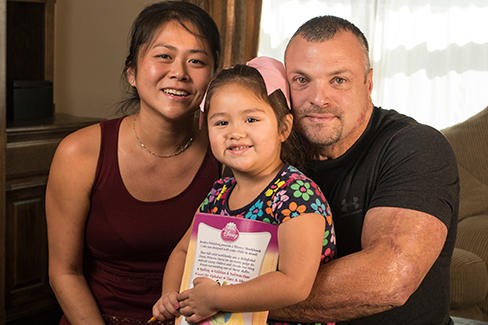 The Parkland Burn Center is here to treat those in need with the most advanced, compassionate care practices, helping patients like Troy get back to their families and lives.